Maxine Hildebrandt knew she was on to something when she spotted one of her students eating fish. This particular elementary-aged student was known for being unwilling to try anything new, and fish was definitely not on his list of acceptable foods. Yet there he was, sitting on a patch of uncomfortable ground, happily munching away on trout. The transformation occurred during a cultural exchange that took place last year. Hildebrandt teaches at Mother Earth’s Children’s Charter School, an Indigenous school southwest of Stony Plain, and she organized the exchange with Lisl Gunderman, a teacher at Wildwood School, where the community has deep Ukrainian roots. “What pleased me most was seeing transformations happening in my students, where they totally embraced learning moments and forged new friendships with other like-minded students,” Hildebrandt wrote in a summary report following the four-month exchange program. The program is offered by the Canadian Multicultural Education Foundation in partnership with the Alberta Teachers’ Association. Its aim is to promote understanding between Alberta’s Indigenous and non-Indigenous students. The exchanges themselves are organized by teacher partners, one of whom must represent predominantly Indigenous students and the other predominantly non-Indigenous students. The program provides grants from $500 to $5,000 to cover 90 per cent of exchange-related expenses. Through in-person visits or electronic contact, the exchanges aim to maximize students’ understanding of each other’s values, aspirations, challenges, family life and community life so they are able to get beyond stereotypes and respect each other as individuals. “Kids on reserves don’t understand white kids and white kids don’t understand reserves and are afraid of each other at some level,” said program founder Earl Choldin. Through the program, students learn that they have a great deal in common, such as what they find fun and exciting and what worries them about the future, he said. “The challenge of building one Canada where we all appreciate each other is maybe one of the biggest challenges we face as a people,” Choldin said. The program has $20,000 available this year, Choldin said. Applications are processed as they arrive. If they meet the criteria, they will be approved. Teacher Gordon Power participated in the program last year and is volunteering to co-ordinate it this year. He’s eager to spread the word about the program and said he can help teachers connect with a partner if they don’t have one with whom to plan the exchange. After finding out about the program through its website, Hildebrandt connected with Gunderman, and together they planned a series of activities that included “all about me” posters, letter writing and scrapbooking as well as four group field trips to each other’s schools. 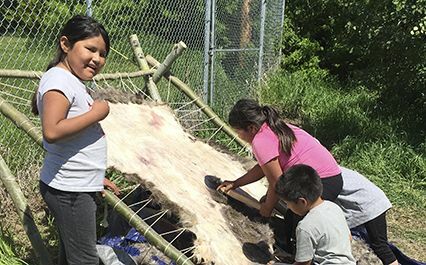 The trips included studies of conservation, hide tanning, powwows, the history of coal mining in the Evansburg area, gold panning, a visit to a stocked trout pond and a literacy project with Métis author David Bouchard. While the program enabled the students to learn about each others’ cultures, it also exposed students to aspects of their own culture and traditions that they didn’t know about, Hildebrandt said. The most transformative result from the exchange was its impact on her fish-eating pupil. Before the exchange he was a quiet, reluctant learner who stayed in the background. After the exchange he became much more engaged. He is now vocal and has shown a talent for art that he is willing to share with his peers. “It just awakened something in him,” Hildebrandt said of the exchange program.